I lived in the Flint Hills of eastern Kansas for nine years and took great pleasure in the sunlight, wind and wide-open prairie. Relaxation after a stressful week of work was easily obtained by laying in the grass to soak up the warm sunlight and feel the wind message my body. I carry quite a bit of photo equipment since I shoot a large format camera. My typical load consists of a 4inch x 5inch view camera (a “field” model which can be folded compactly to make it more suitable for hiking), four lenses, a regular bellows for three lenses and bag bellows for a wide-angle lens, film, film holders, a 1-degree light meter, color filters and a heavy wood tripod (weight is needed in windy environments). When lunch, water, rain gear and a few other things are added, it is a lot to carry. Consequently, I also take a lightweight two-wheeled cart to hold everything. It is considerably easier to pull or push my gear on the cart than carry it. The cart allows me to cover several miles comfortably whereas I would strain carrying my gear without the cart. It was my favorite kind of day for landscape photography. The sky contained plenty of large, well-defined clouds which produced big shadows on the ground as well as splashes of direct sunlight. Along the Schoolhouse Spur I attempted to photograph the natural beauty of the open prairie and the subject of today’s blog was one of those photos. It shows Fox Creek in warm sunlight as it winds across the broad expanse of the prairie in the Kansas Flint Hills. The composition included a broad, grass-covered hillside in the foreground that gradually sloped down to Fox Creek where it met more hills which rose behind the creek. The scene simply “felt” like the Kansas prairie to me. Nearly half of the composition consisted of clouds which needed plenty of structure to justify such a large area in the photograph. I observed the sky through medium yellow and dark yellow filters to subjectively evaluate their effects on cloud structure. Since clouds were so important to the image I selected the more powerful dark yellow filter. I spent about five minutes watching the scene and concluded that two areas needed special attention. First, the foreground grass which occupied a large area in the photograph was very important because grass more-or-less defines the prairie. Consequently, the foreground needed emphasis and the rapidly moving clouds offered an opportunity to provide that. That is, I could wait patiently until shadows and areas of direct sunlight moved across the foreground to provide visual emphasis. Second, Fox Creek itself was important because it tied the composition together. Similar to the foreground, visual emphasis could be provided through shadows and direct sunlight. I watched the scene and decided that trees along the creek looked best when some were illuminated by direct sunlight and the hills behind them were shadowed. I had a plan and only needed patience while areas of sunlight and shadow moved across the scene. Fortunately, the sky had plenty of broken clouds and the wind rapidly moved them across the landscape to change the scene quickly. After only about fifteen minutes, areas of sunlight and shadow were positioned favorably so I exposed a sheet of Kodak Tri-X black & white film at 1/8 sec and f/32. The film was marked for normal (N) development. It is obvious that the film was not exposed and developed properly. More exposure was needed to deepen the dark tones and more development was needed (e.g. N+1) to lighten bright tones and achieve more contrast. Careless light meter readings were the cause of this problem but I was fortunate because no image tones were blocked without texture as pure black or pure white and the drum scanner provided good bit depth (16-bit pixel depth) so image tones could be adjusted readily. PhotoShop’s Levels Adjustment tool provides image histograms. The gray-level histogram for my scanned film is provided below with dark-to-light tones of the histogram displayed from left-to-right. The histogram clearly shows that the image lacked dark and bright tones but the problem was corrected quickly with a Levels adjustment. The black slider on the left was moved from 0 to 52 to increase image darkness while the white slider on the right was moved from 255 to 205 to increase image brightness. Those adjustments stretched the histogram in both directions and increased image contrast. 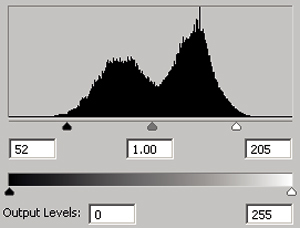 Pure black, pure white and all other gray levels were present in the image after Levels adjustment as the following histogram shows. The affect of Levels adjustment on the image is shown below. The feeling of bright sunlight and rich shadows was strengthened. This is how the image would have looked if it had been correctly exposed and developed in the first place. Next, local retouching was performed using PhotoShop’s Burn and Dodge tools. The original image layer (image from the scanner) was duplicated, named “Retouch” and placed directly above the original layer to contain retouching edits. I place all edits in different layers than the original image layer so the edits can be discarded if needed. The overall goal of local retouching was to increase the presence of light and help keep viewer’s eyes within the image. First, attention was directed to the source of light – the sky. The area most needing help was the large bright cloud near the image center at the the top of the photo and PhotoShop’s Burn tool was used to reduce its brightness. Numerous other small bright areas near this large cloud also were burned darker to create a dark band of sky above the other clouds. Comparing the previous image with the following image shows that the edit helped separate the other clouds from the sky. The edit also strengthened top-to-bottom and front-to-back depth in the image. Note how editing seemed to lift the clouds higher above the terrain. Several small bright areas in clouds bordering the sides of the image were darkened slightly with Photoshop’s Burn tool to help keep viewer’s eyes from falling off the image edges. Comparing the previous image with the following image shows that the affect is most pronounced on the right side of the photograph. Note how this edit helped separate the clouds near the right side of the image and lifted them higher. Next, attention was directed to the broad hill on the horizon to the right of image center. Gray tones of the hill merged somewhat with tones of the sky so increased separation between the hill and sky was needed. The image was enlarged considerably on the computer monitor and PhotoShop’s Burn tool was used to darken midtones in the hill. Increased tonal separation between the hill and sky can be seen in the following image although differences are not easily visible in the tiny web image displayed here. The benefit of this edit is notable in larger images where more detail is revealed. In large prints, the edit helps the hills feel like they extend a bit further toward the horizon so front-to-back depth is increased a very slight but important amount. The grassy foreground was edited next. This area is important because grass is a defining element of the prairie and can be resolved clearly in the foreground. The editing goal was to visually emphasize foreground grass by increasing the presence of sunlight on it. PhotoShop’s Dodge tool was used to brighten the large area of sunlit grass which enters the foreground from the right edge of the image. Then, the large dark area of grass that spans the width of the photo at the bottom was darkened slightly to help strengthen the sunlit area. Other areas of sunlit grass and shadow in the image were edited similarly to further increase the presence of sunlight. The effect of editing foreground grass can be seen by comparing the previous and following images. Editing clearly helped the grass become more prominent in the photograph and increased the feeling of front-to-back depth. Sunlit trees along Fox Creek were edited last. The image was enlarged substantially on the computer monitor and PhotoShop’s Dodge tool was used to lighten the brightest tones on tree branches which were illuminated by direct sunlight. Brightening sunlit trees helped increase their presence along the creek. Of particular importance is the far right tree which stands alone in front of shadowed hills. 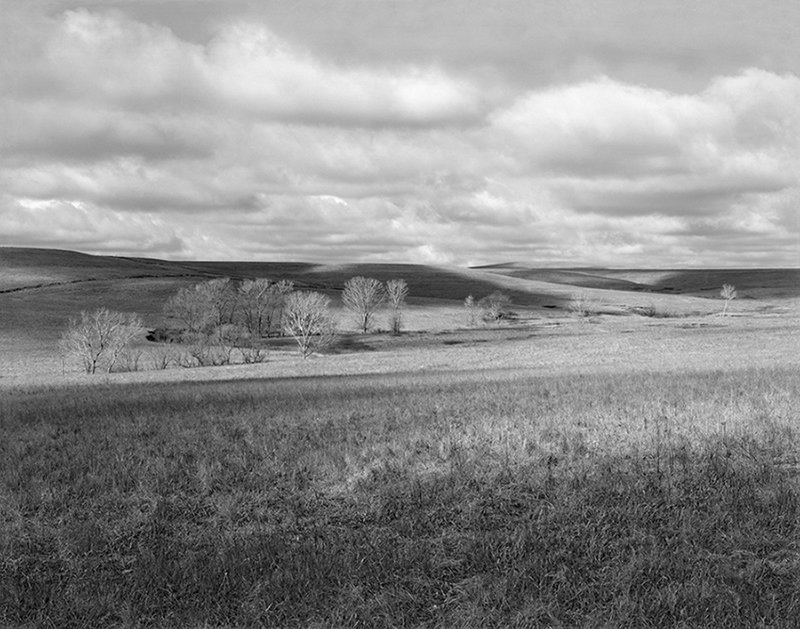 Increasing its presence draws viewer’s eyes to the right and helps them sense that the prairie is wide-open. The following image adds all retouching edits to the previous image. The affect of individual retouching edits can be seen by comparing the previous and following images carefully. I am pleased with this photograph and think it does a good job of capturing the open prairie in warm sunlight. The image looks good when printed to nearly any size although I prefer a large print which reveals lots of details that are not seen in smaller prints. I tone this image during printing to be slightly warm to enhance the feeling of warm sunlight. The tone is very subtle and detected by few people unless neutral and toned prints are observed side-by-side. Even though the warm tone is subtle, it has a powerful affect on the emotional content of prints. Unfortunately, it is difficult to show this on web images which usually are viewed on small devices that are rarely calibrated for color. 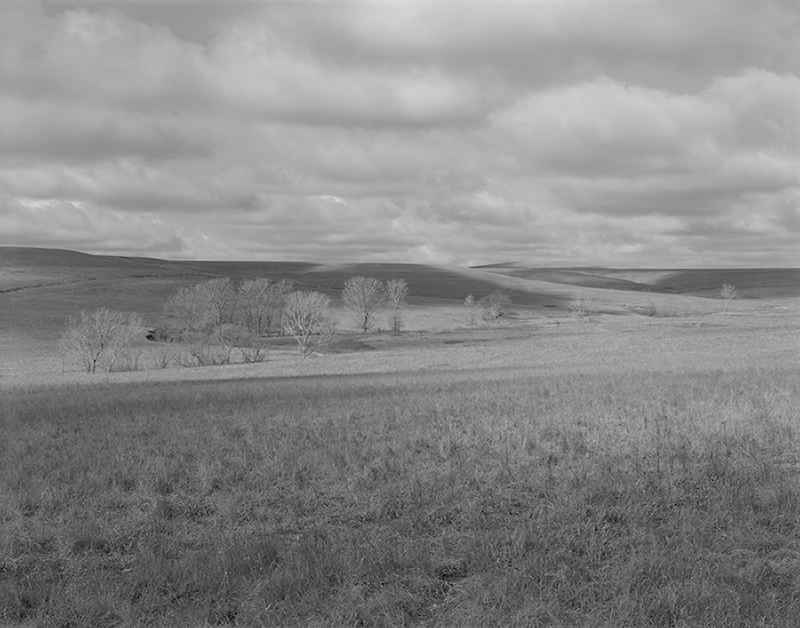 Today’s photograph was an attempt to capture the natural beauty of the prairie in the Kansas Flint Hills. The composition includes a creek which ties the scene together and incorporates shadows and direct sunlight to visually enhance important image components. Plenty of detail captured by the 4×5 film allows impressive prints to be made. Comments you might have about the image, the photographic approach used for it, the composition or its workup will be appreciated. For a slightly better view of this photo, visit here.